This brand new Mr Coffee Keurig machine I just bought at a Costco is a Single Cup Brewer game changer. Why? Well, for starters, the Mr Coffee from Costco is about half the price of other single-cup Keurig brewers and it comes with 20 K-Cups for 20 cups of coffee. This is one of those products that I love outside of the box so quickly and unreservedly that I almost hate to continue using it, lest I find some faults with it. The Keurig machine is an impressive single-cup coffee maker and and an affordable one – at least in the short term. I recently reviewed the Tassimo in my Tassimo vs Keurig article two weeks prior to buying this little, inexpensive single cup brewer. I went to Costco to look for Tassimo Coffee when unexpectedly, I found a demonstrator brewing single cup coffee samples with this Mr Coffee Keurig single cup brewer. The cheap price tag quickly caught my eye and I wondered if a coffee maker so cheap could be any good. As I looked at the display, I noticed the words on the box said, “Keurig Brewer”. Having been very impressed with the Keurig Brewer at the Loews Hotel I stayed at in Philadelphia, I decided the Keurig Mr Coffee maker was worth a closer look! Aside from a very affordable purchase price, there is a tremendous selection of affordable coffee you can buy for your Mr Coffee Keurig. 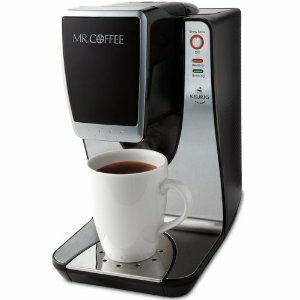 The Mr Coffee version of the Keurig uses the very same K-Cups as do all Keurig single cup coffee brewers. By discovering this gem at Costco, I also discovered a large selection of K-Cup coffee variety packs for a very affordable price of less than 50 cents per cup. When I told the demonstrator that I liked a dark, bold cup of coffee like Starbucks, she made me a cup using the Newman’s Organic Extra Bold K-Cup that comes with it. The Costco product came with an additional 15 K-Cups for a total of 20 cups of coffee. The Newman’s extra bold was delicious and satisfied my craving for a cup of Starbucks coffee despite their advertised special of free coffee on ‘earth day’. I was sold. The Mr Coffee single cup brewer would be a perfect way to eliminate carrying a coffee thermos to work every day. From now on, I will make coffee at the office with the Mr Coffee Keurig brewer. Several weeks later and I do have one pretty serious complaint about the Mr Coffee Keurig. Try this: Brew a cup of water without using a K-Cup. If your machine is like mine, you’ll get a light-brown, dirty cup of water with a few used-up grounds in it. That wouldn’t be so bad if this occurred after brewing several cups of coffee, but it only takes one cup to cause the residual, used coffee to appear in a cup of water. This has caused me to want to continually clean the pot by brewing a cup of straight water after each and every cup of coffee is brewed. That’s a rather big inconvenience, but who wants to drink dirty coffee? One of the benefits of the Keurig Brewer is that it is a very clean-brewing, self-contained unit that makes no mess and is easy to use. If someone else could comment on another brand of Keurig Brewer, I’d be curious to know if they get the same results with dirty water after each cup. 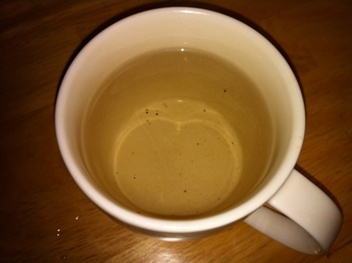 The picture illustrates what a cup of clean water looks like after being brewed through the Mr Coffee Keurig. This is after only one cup of coffee was brewed in the previously cleaned Mr Coffee Keurig coffee maker. When you see this it makes you want to run a cup of clean water through the machine every time you use it. Not very convenient, is it?